"This year is the Centenary of Federation of Australia, and this recipe was provided by the great-granddaughter of Henry and Isabella Parkes (your equivalent of a first lady). In Australia, we call them biscuits, rather than cookies, but they are well worth trying." Preheat the oven to 400 degrees F (200 degrees C). In a small bowl, dissolve baking soda in hot water. Stir in the dates and raisins; set aside. In a medium bowl, cream together the butter and sugar until smooth. Beat in the eggs one at a time, then stir in the date and raisin mixture. Combine the flour and cinnamon; mix into the batter until just blended. Finally stir in the walnuts. 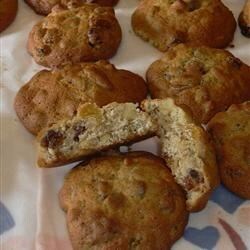 Drop dough by tablespoonfuls onto the prepared cookie sheet. Cookies should be at least 1 inch apart. Bake for 8 to 10 minutes in the preheated oven, or until lightly browned. Allow cookies to cool on baking sheet for 2 minutes before removing to a wire rack to cool completely. It was delicious and my classmates did also like it!! !